Plate 16 of 'Hindoo Excavations in the Mountain of Ellora near Aurangabad,' engraved by Thomas Daniell after the drawings of his deceased friend James Wales, which Daniell regarded as the sixth set of his 'Oriental Scenery.' 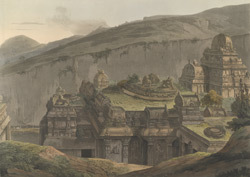 This bird's-eye view in two parts (see also plate 15) reveals the extraordinary complex of the Kailasanatha temple. The temple is a free-standing monolith which lies in the middle of a vast pit surrounded by a deep trench excavated into the hill. The main sanctuary has a pyramidal cover surmounted by an octagonal domed-roof. It is attached to columned hall and connected by a bridge to the Nandi pavilion and the gate.